If you’re a fan of time management games, chances are high that you’re a bit of a perfectionist. There’s nothing wrong with striving to be the best, and there’s also no shame in getting a little help along the way! The eleventh edition of the Delicious series is packed with tons of challenges beyond beating all 60 levels, which is why this Delicious Emilys Home Sweet Home walkthrough was written: to help you reach 100 percent completion. Below you’ll find the requirements for obtaining all trophies and items for Emily’s house including all mouse locations as well as general cheats, tips and tricks. 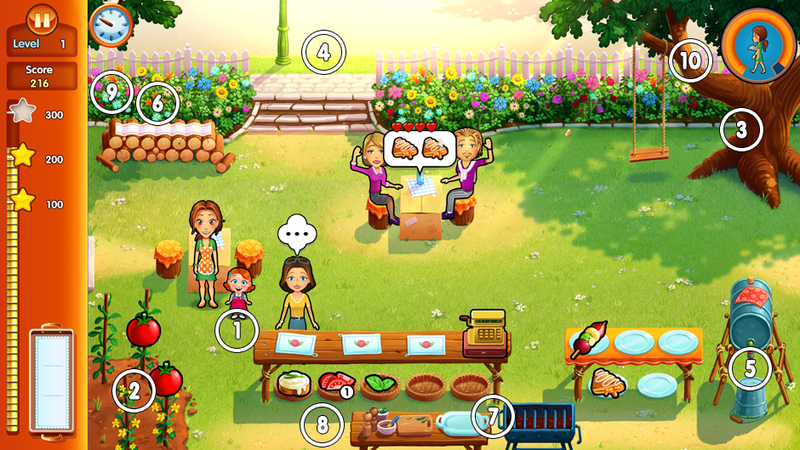 In Delicious 11 – Emily’s Home Sweet Home, you manage six different restaurants in order to help Emily remodel her dream house. 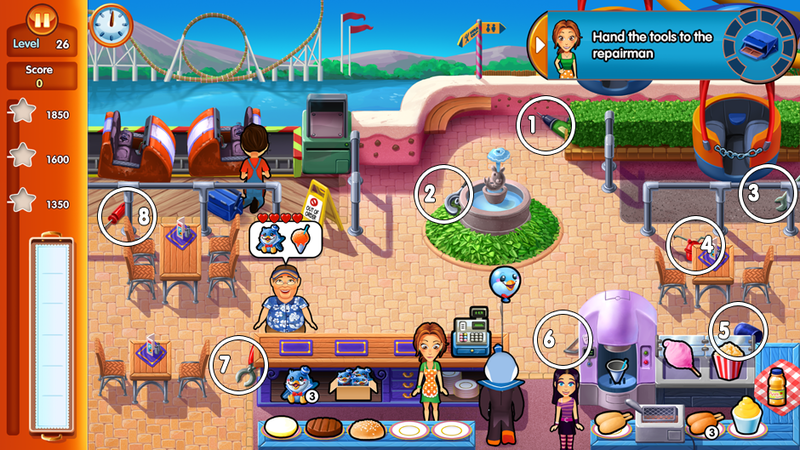 Each level consists of a shift during which you must take orders, prepare food, serve customers, accept payment and clean up. Customers may give you large tips if you serve them promptly, or they may get up and leave if you don’t attend to them quickly enough. Customer patience is measured in hearts; a customer will leave when they drop to zero hearts. You must reach a target amount of points for each level by satisfying enough customers to move on to the next day. There are 60 regular levels, and 30 additional challenge levels. 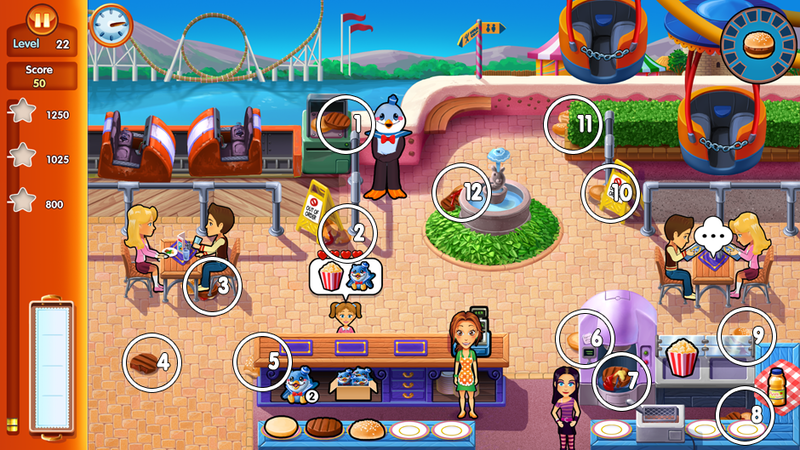 Each level can be completed with one, two or three stars depending on how much money you make. Every level also has a mini-challenge, for which the reward is a diamond that can be traded to purchase items for Emily’s home. 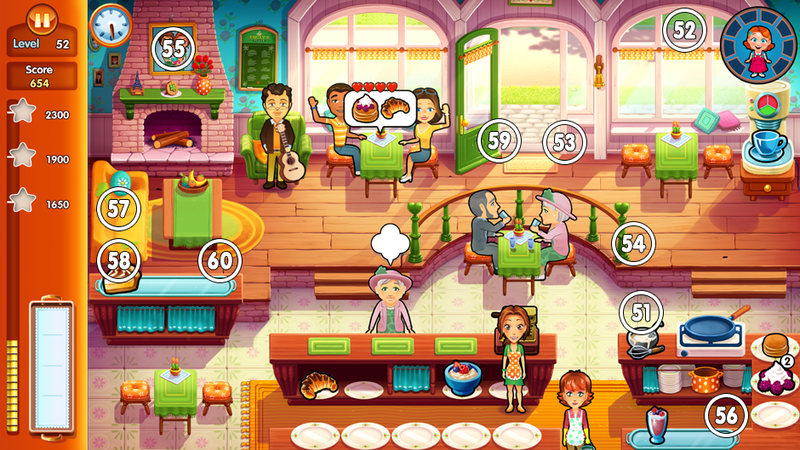 Food preparation increases in complexity throughout the game. 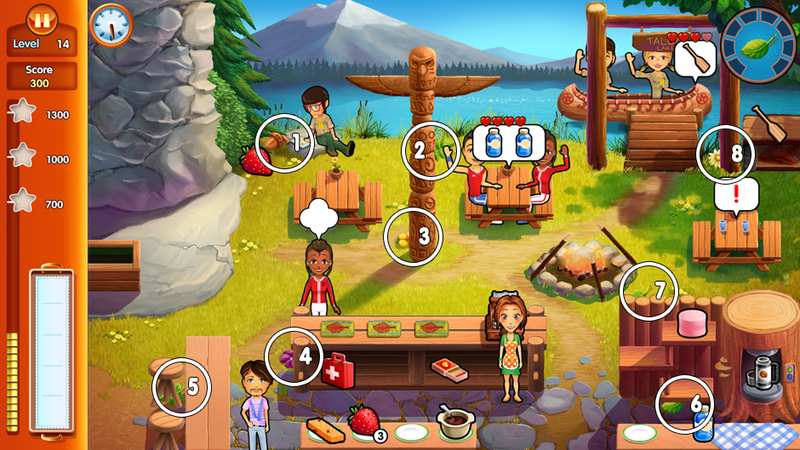 Some items must be restocked, combined in a certain order, or cooked for a certain amount of time before serving. You’ll unlock new menu items as you complete levels, which can make pleasing customers easier, so make sure to update your menu regularly! After customers leave, you must click on their dishes to clean up after them. If you don’t have clean tables when a new customer comes in, they might leave. As you progress, you will be given cleaners who handle this task. You can maintain customers’ patience by sending them an entertainer while you serve other guests. Use your entertainers often to satisfy customers so that they leave bigger tips. Be aware the entertainers can only help customers which are seated at a table. Emily can reinvest her profits into decorations. Decorations improve customer patience and happiness, so they can help generate bigger tips. 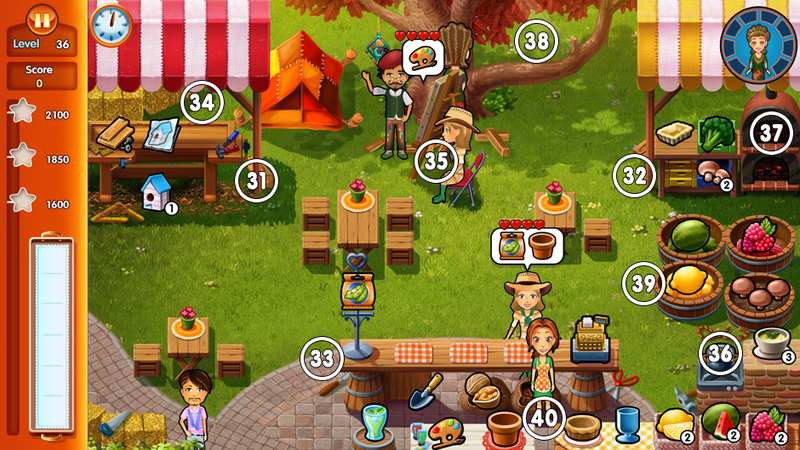 You can easily make extra profit by purchasing decorations, so don’t neglect your restaurant’s aesthetics! You will encounter different customer types at each restaurant. See the walkthrough and diamond challenge section for customer profiles at each location. 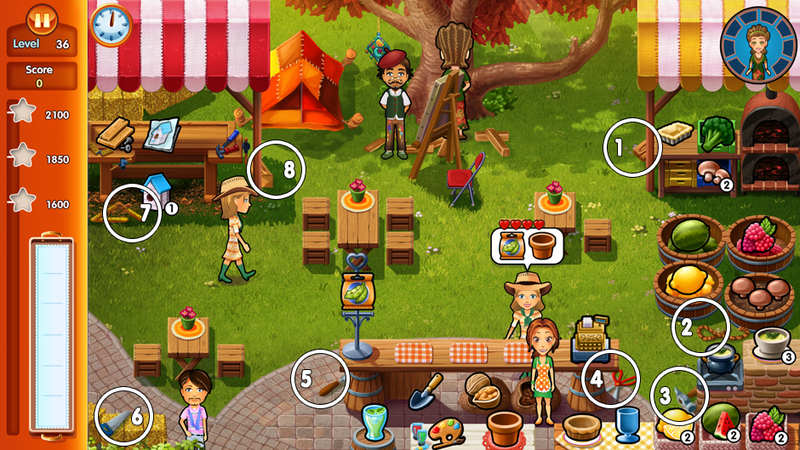 You can also see the different customer types in a level by accessing the menu. Customers of the same type have similar levels of patience, leave similar tips and make orders of similar complexity. Identifying a customer’s type can help you prioritize your serving when the restaurant is busy; for example, you may want to cater to a big tipper with low patience before helping your more frugal customers with higher patience. At the beginning of each level, you must choose from your available items to set a menu for that day. You will have limited options at first, but new items will quickly become available as you progress through each day. New items offer various benefits. Some are quicker or easier to prepare, which means you can provide faster service and make better tips. Other items, such as spill-proof products, help you avoid mishaps that occasionally slow down your service. 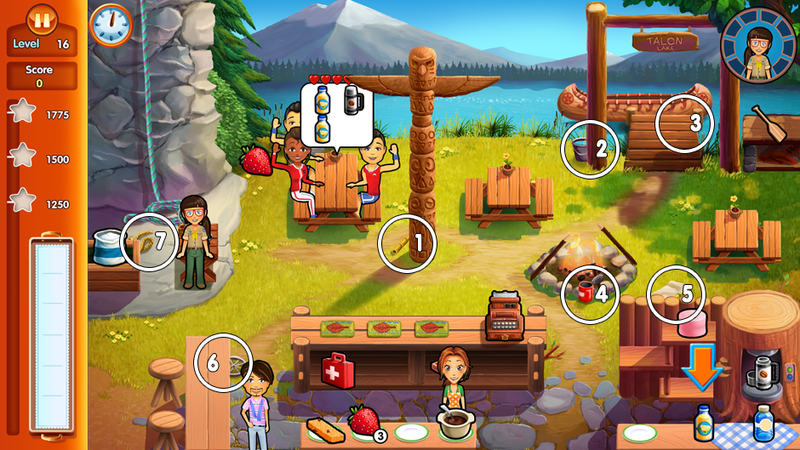 Experimenting with different menu combinations is a good strategy if you are having trouble with a particular level. Emily’s serving trays only hold a set number of items, although you will be given larger trays as you reach higher levels. If you accidentally add an item to your tray that you didn’t mean to, just click on the item to throw it out. Each restaurant has a shop where you can purchase new equipment and other items to make your customers happier, which means they will leave bigger tips. Investments pay off quickly, so don’t hesitate to spend money when you have it. 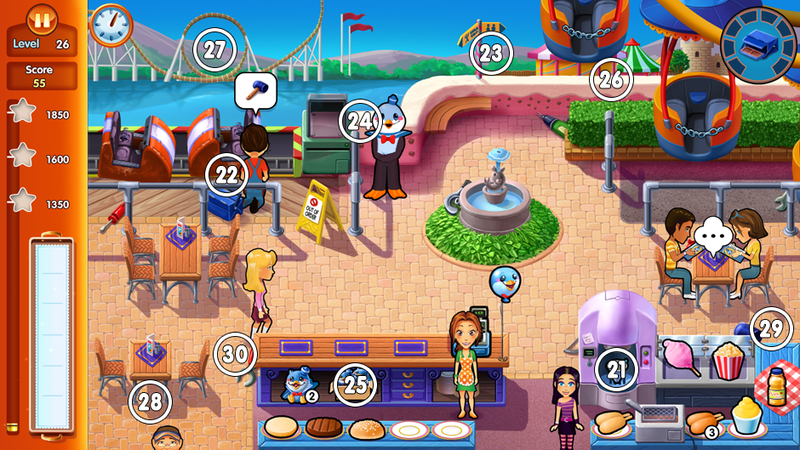 On the map for Happy Funtime Land, you can click on the air plane near level 28. When you do, you’ll see Emily flying though the sky. Click on her to unlock a hidden game called Emily’s Air Race. You must use your mouse to guide Emily while collecting coins. If you hold the mouse down for a while, Emily will make a loop. This little game offers no trophies or other rewards, but it is a fun distraction if you want a break from the main game. Level 1: Walk 100 yards. Level 2: Set up the decorations. Level 3: Achieve 5 quick bonuses by providing prompt service. Challenge 2: Your serving tray slowly breaks away decreasing the number of items you can carry at once. Work as quickly as possible to meet the target. Level 5: Only serve complete orders. Be careful not to burn the ribs; they only need to be on the grill for a few seconds. Purchase the new grill for $150 at the store to avoid this problem. Challenge 3: All orders are for flowers. This may require several attempts to complete; if you unlock a new flower but fail to meet the target goal, you can still use the new item when you retry, so keep at it until you unlock all of your flower options. It becomes a lot easier when the new flowers are unlocked. Level 6: Serve the committee members. Level 7: Achieve one star during the first half of the day. Challenge 4: Do not lose your VIP customers. Serve the VIP customers first, and send Billy to keep everyone else entertained. Level 9: Serve five ecstatic customers of each type. That’s a total of 20 ecstatic customers. This requires serving the orders while the customers still have all of their hearts. Challenge 5: Your tray can only carry three items and all customers enter in a bad mood. Serve the counter customers first while sending Billy Jr. to entertain the seated guests. Then serve the customers in order of patience from lowest to highest: yuppies first; kids and regulars next; and seniors last. 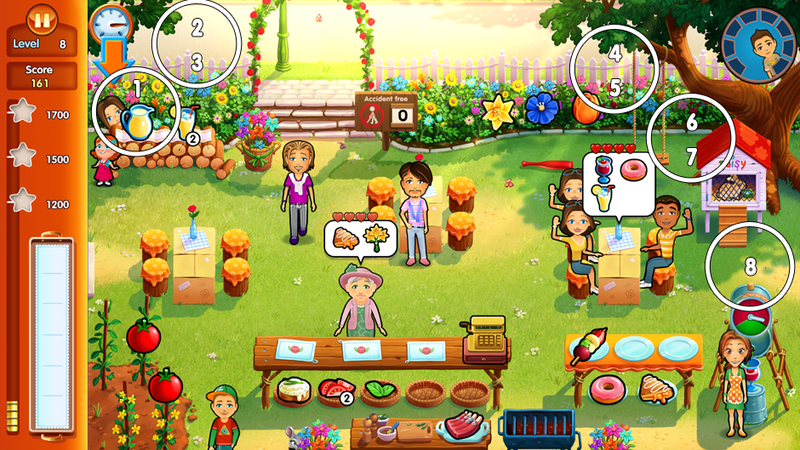 Level 10: Make one of every product, including a bouquet with each flower and all three sandwich types. Before customers start to order, you can simply add these items to your tray and immediately remove them to count toward your goal. Level 11: Serve ten ecstatic customers. Toasting marshmallows over the fire gives you some extra time to prepare other items. Challenge 6: Do not let children have the matches or knives. The children are creative they will come and ask for two items – like a drink and matches. You don’t have to serve! They will continue asking for the matches, and if not served eventually walk away angry. Canoeing is also introduced in the level; be sure to look out for people who need paddles. Level 12: Pack the backpack. Level 13: Serve 10 customers in 60 seconds. Let the orders build up, then carefully plan your serving trips. Challenge 7: Serve customers precisely in the order they arrive. This can quickly become hard to keep up with, as customers sit in different locations. Focus on one order at a time. Extra tip for the challenge: Sometimes customers arrive at the same time. Usually one customer goes for food while the other customers go canoeing. Most mistakes are made with these customers! 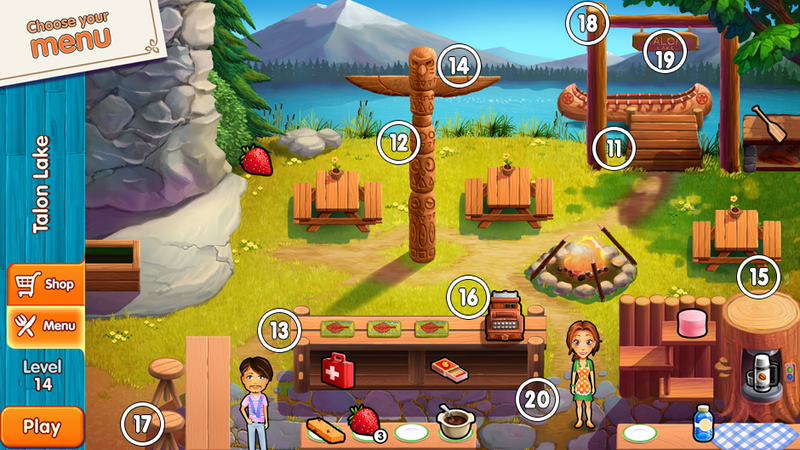 Level 14 – Plant locations in Delicious Emily’s Home Sweet Home. Level 15: Do not burn any items. Challenge 8: Clean large messes left by customers. Level 17: Utilize only two tray spots. Make sure to stir the soup in this level so that it doesn’t boil over. An alarm will sound if you do not stir frequently enough. Challenge 9: Waste nothing during the day. 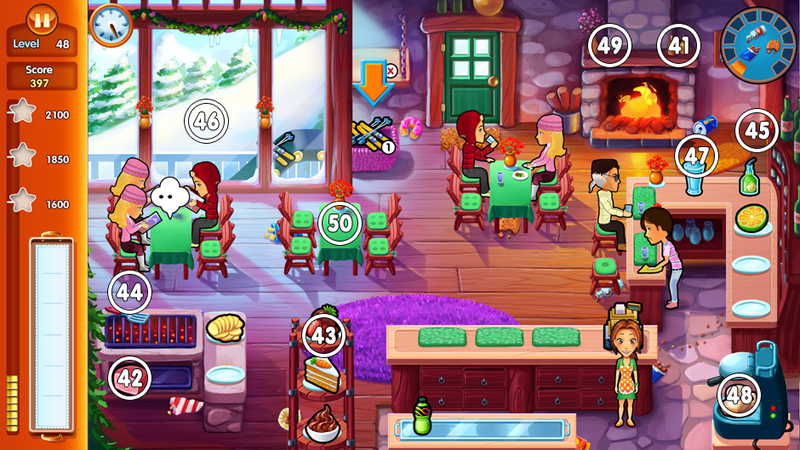 Level 18: Clean three tables in a row three times. Level 19: Go 30 seconds without serving anyone. Challenge 10: Groups come in waves. Level 20: Receive the six packages. 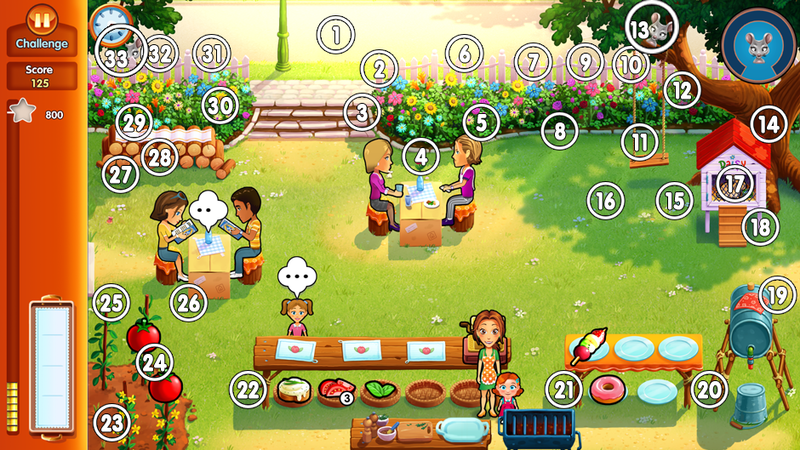 Customers types restaurant 3 in Delicious Emily’s Home Sweet Home. Level 21: Entertain five customers. Challenge 11: Work without your cleaner. 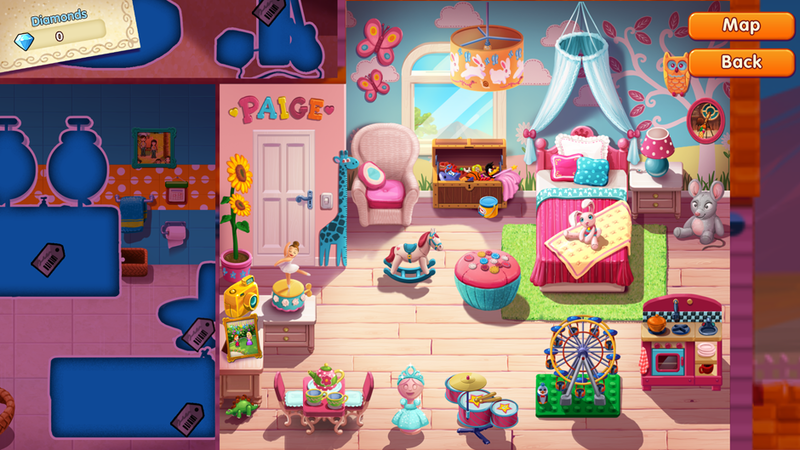 Level 22 – pieces foodfight locations in Delicous Emily’s Home Sweet Home. Level 23: Make 40 sweets. You can simply add and remove funnel cakes to and from your tray to count toward the total. Challenge 12: Serve several large groups. Level 24: Snap six pictures of Paige on the Ferris Wheel. Simply wait by the camera for her to pass by. You may be able to catch two pictures at once. Level 25: Walk 1,000 yards. This may require extra walking between tables. Level 26: Give the eight tools to the repairman. He asks for them in random order. Level 27: Launch three full roller coaster rides. Take pictures and serve them to the customers otherwise they are not willing to exit the ride. Challenge 14: Receive 100 points for each table you entertain. Level 28: Inflate the inflatable man. Level 29: Make $850 in tips. Challenge 15: Only receive points from ecstatic customers. Level 30: Do not serve sodas or fried snacks to kids. Slushies are OK to serve. Level 31. Achieve 20 chains, bonuses or combos. Challenge 16: Table customers request double orders. Level 32: Assemble the tent. Level 33. Make sure all customers stay at four hearts or greater. Challenge 17: No points are given for serving single customers. So try to combine single customers and check them out in pairs to gain points. Level 34: Reassure Moon Blossom five times during the level. Level 35: Use 45 re-stockable items. Challenge 18: All customer order items that must be restocked. Level 36: Give the eight tools to Moon Blossom. The order in which she requests them is random. Level 37: Don’t let any products fall to zero stock. Challenge 19: Alternate between serving table customers and the counter customers. Level 38: Serve the Moon Blossom and Sun Lotus. Level 39: Get one star by the end of the first half of the day. Level 40: Finish the level with all products fully stocked. Challenge 20: Items spoil on the tray if not quickly served. Level 41: Recover the skis in 25 seconds. Challenge 21: Emily works slower as the day progresses. Tip: Wait with giving Emily a new order until she slows down. She will catch her breatch very fast and this will help you to finish the challenge almost at normal serving speed. Level 42: Receive the six packages from Chuck. 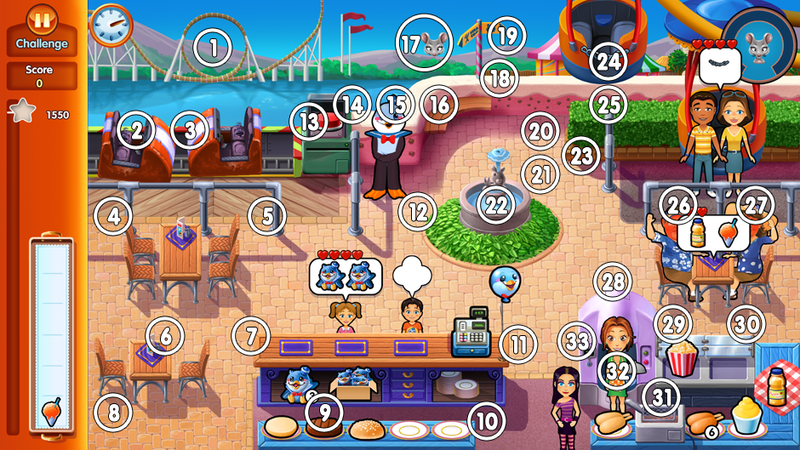 Level 43: Serve five customers of the same type in a row. This is best accomplished with the five seniors who appear near the beginning of the level. Extra Tip: bringing them the items one by one also counts towards the requirement! Challenge 22: Cook 25 items on the grill. Level 44: Untangle all of the skis. Level 45: Make 10 of each type of dessert. Challenge 23: Clean each table in 13 seconds. Level 46: Serve Marissa and Aaron. Level 47: Obtain 12 quick bonuses. Challenge 24: Work with breaking appliances. You can see when an appliance is broken, as it will appear slightly disintegrated. Clicking it will not provide you with orders after it is broken. To fix it, click on the appliance and wait. It will take a short while to do, but you can serve your orders again. Be aware it will probably break a second time during the challenge. 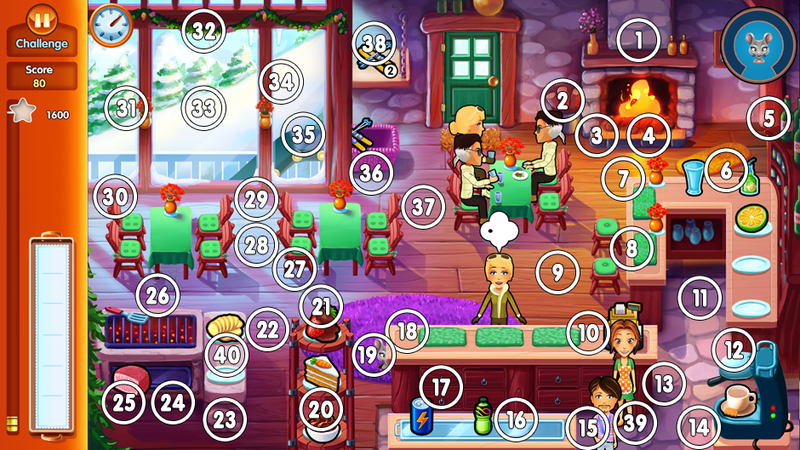 Level 49: Serve exactly eight angry customers. It’s best to allow the seniors and socialites to drop to one heart after ordering one item. That way you can quickly fix their order before they leave, and you won’t lose much money because they leave the smallest tips anyway. Level 50: Serve three full trays. Level 51: Utilize only two spots on the serving tray. Challenge 26: Customers sitting at tables order three times. Level 53: Serve only complete orders. Challenge 27: Serve a large number of business people. Level 54: Receive the six supply packages from Chuck. Level 55: Waste no pancake or tap products. Challenge 28: Restock pancakes in just 8 seconds. Level 56: Serve the scouts. 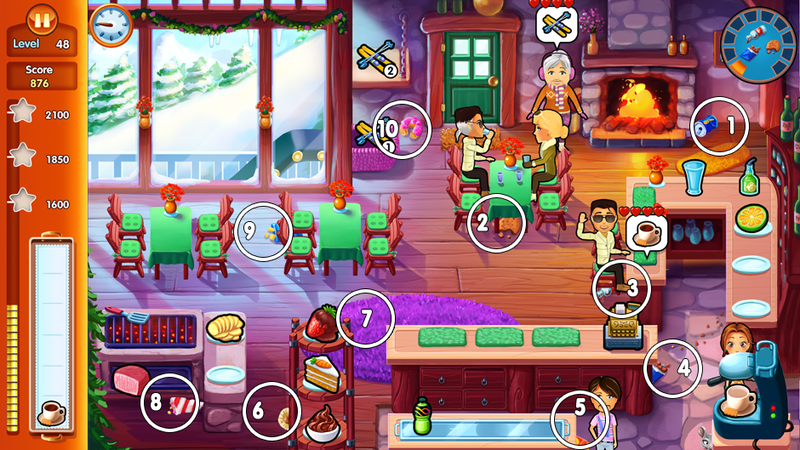 Level 57: Earn $1,260 in tips (In the previous versions of the game, the goal was $1500. You can download a newer version of Emily’s Home Sweet Home to lower the goal to $1,260 if necessary). Challenge 29: Serve while walking super-fast. Level 58: Set up decorations. Level 59: Walk 1,500 yards. Challenge 30: Serve a long single line of customers. Level 60: Make one of every product in Emily’s Place. Trophies are awarded for meeting certain milestones. They come in the form of decorations for Paige’s room. Below is a list of all the trophies and how to unlock them. Full Storage Chest Select every product in every restaurant at least once. There are 165 items to be chosen in total. The pictures are placed in the following rooms of the house. Carl the mouse appears in a different location in each level. You will hear a squeak when he shows up on screen; click on him quickly to capture him before he disappears. You may get a couple of tries for each level. You must capture Carl in every level to win the Carl trophy. All mice in restaurant 1 in Delicious Emily’s Home Sweet Home. All mice in restaurant 2 in Delicious Emily’s Home Sweet Home. All mice in restaurant 3 in Delicious Emily’s Home Sweet Home. All mice in restaurant 4 in Delicious Emily’s Home Sweet Home. All mice in restaurant 6 in Delicious Emily’s Home Sweet Home. If you find yourself stuck on a level, consult these Delicious Emily’s Home Sweet Home walkthrough videos as a guide for cheats, tips and tricks to help you complete the game to 100 percent. Congratulations! You’ve completed our Delicious Emily’s Home Sweet Home Walkthrough! Go to Zylom to play this game! The Delicious Emily’s Home Sweet Home Walkthrough is meant as a guide and does not contain cheats, hacks, or serials.